. machi, choo 町 small town or village - districts and Haiku . 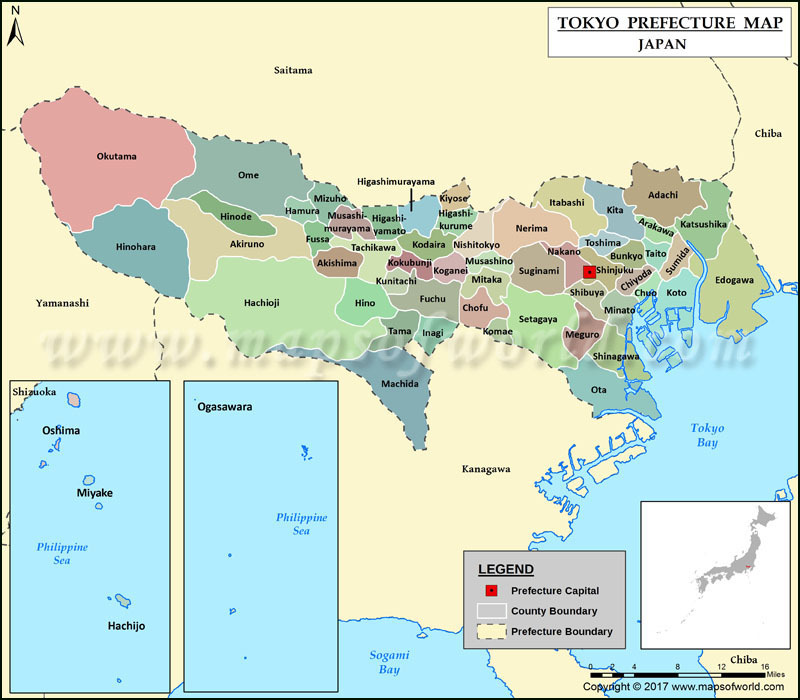 The wikipedia has now extensive coverage about Tokyo and the districts of Edo. 20 books divided among seven volumes. Initially published in 1834.
. - - - Persons and Place Names - Index - - - .
. Legends 伝説 from the 23 Tokyo wards .
. Edo Tokyo Hyakkei 百景 100 views of Edo / Tokyo .
. kawa　江戸の河 -- 江戸の川 the rivers of Edo .
. saka, sakamichi 坂道 the many slopes of Edo .
. Adachi ku 足立区 Adachi ward . 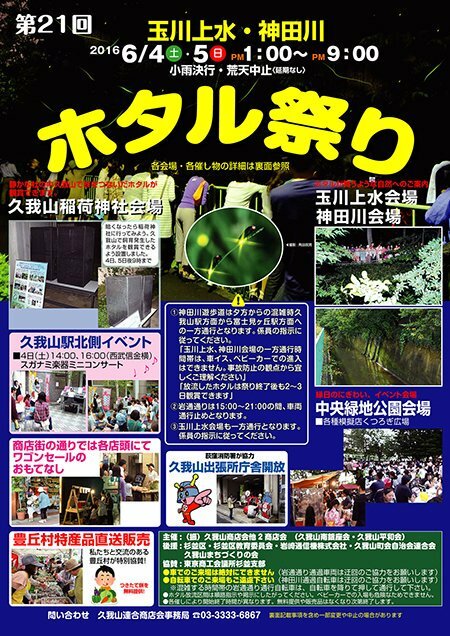 - Akasaka Kiribatake 赤坂桐畑 district, "paulownia fields"
- Akasaka Tamachi 赤坂田町 Tamachi district, "district of fields"
. Amanuma district 天沼 "heavenly swamp" - Suginami ward .
. Anjinchoo 安針町 Anjin-Cho, Anjin Cho district .
. Aomonochoo　青物町 Aomonocho "vegetable" district .
. Arakawa ku 荒川区 Arakawa ward - "wild river" .
. Asakusa 浅草 district . - - - - - . Asakusa Kannon　浅草観音, temple 浅草寺 Senso-Ji . .
- - - - - Azabuipponmatsu 麻布一本松町 Azabu Ipponmatsu district "one pine tree"
. Bakurochoo, Bakuro-chō 馬喰町 Bakurocho district . Banchoo 番町 Bancho and . Kōjimachi 麹町 / 麴町 Kojimachi district .
. Bunkyoo, Bunkyō 文京区 Bunkyo ward, "Literature Capital" .
. Chiyoda ku 千代田区 Chiyoda ward "Fields of Eternity" .
. Chūō ku, Chuuoo Ku 中央区 Chuo Ward "Central Ward" .
. Daikuchoo　神田大工町 Kanda Daikucho, carpenter district . - river 小名木川 Onagigawa /高橋 Takahashi bridge / Mannenbashi 万年橋　"Ten Thousand Year Bridge"
. Edogawa ku 江戸川区 Edogawa ward .
. Egawachoo 江川町 Egawa-Cho, Egewa district .
. Eitaibashi　永代橋 Eitai-Bashi bridge .
. Fukagawa district 深川 .
. Fukiyachoo 葺屋町 Fukiyacho District of roof thatchers .
. Ginza　銀座 "Silver Guild" district . - - - - - Shin Sakanachoo　新肴町 Shin-Sakana Cho, Shinsakanacho district - "New Fish Village - Market"
- - - - - Rogetsumura　老月村 / 新場橋 Shinbabashi bridge　/ Momijidoori もみじ通り Edo Momiji-dori Avenue.
. Gofukuchoo 呉服町 Gofukucho, district of the Kimono shops .
. Gofunai, Funai 御府内 "The Lord's City" .
. Gyootoku, Gyōtoku 船橋 と 行徳 Gyotoku .
. Hachiman 八幡　Shrines in the Edo period .
. Hachiooji 八王子 Hachioji district and 高尾山 Mount Takaosan .
. Hakkei 八景 Eight Views . 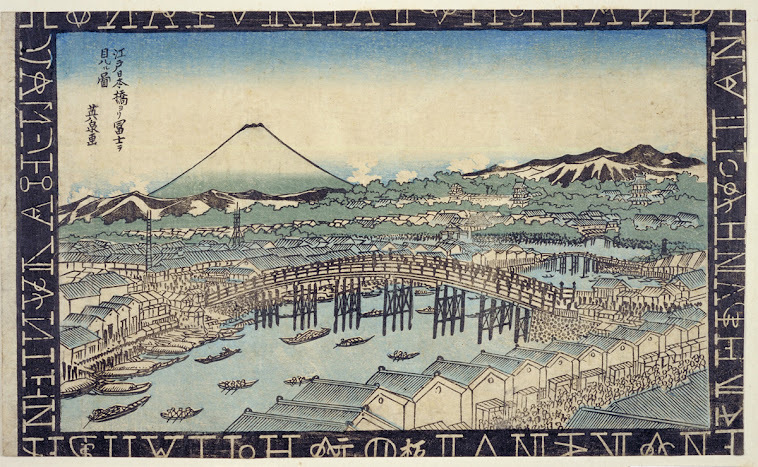 Oomi Hakkei 近江八景 Omi Hakkei, Eight Views of Omi .
. Hibiya 日比谷 / 比々谷 district in Chiyoda ward .
. Himonochoo　檜物町 / 檜物丁　HimonoCho District .
. Hongokuchoo 本石町 Hongoku District .
. Honjo 本所 and Honchoo (Motomachi) 本町 Honcho, Honmachi .
. Honryoogaechoo 本両替町 Hon-Ryogae-Cho district .
. Honzaimokuchoo 本材木町 Honzaimokucho, Honzaimoku-cho district .
. Horiechoo, Horie choo 堀江町 Horie Cho district .
. Horidomechoo 堀留町 Horidomecho District / Horidome rivers .
. Ichigaya 市谷 / 市ヶ谷 / 市ケ谷 .
. Iidamachi, Iida-machi　飯田町 Iidamachi district .
. Ikegami Honmonji 池上本門寺　Ikegami Honmon-Ji　temple .
. Iriya 入谷 and Taitō 台東区 Taito ward .
. Itabashi ku 板橋区 Itabashi ward .
. Iwamotochoo, Iwamotochō 神田岩本町 Kanda Iwamotocho .
. Jinboochoo, Jinbōchō 神保町 Jinbocho, Jimbocho .
. Kagachoo 加賀町 Kaga Cho districts - Ginza, Ichigaya .
. Kagurazaka - Kagurasaka 神楽坂 Ushigome Kagurazaka 牛込神楽坂 .
. Kajibashi 鍛冶橋 Kajibashi Bridge, "Blacksmith Bridge" .
. Kanda Kajichoo, Kajimachi 千代田区 神田 鍛冶町 .
. Kamakurachoo　鎌倉町 Kamakura-Cho in Kanda, Chiyoda ward.
. Kameido choo 亀戸町 Kemeido, Kame-Ido "Turtle Well" .
. Kameyama 亀山 "Turtle Mountain" .
. Kamisukichoo　紙漉町　Kamisuki-Cho, paper maker district .
. Kanamachi kokabu 金町こかぶ small turnips .
. Kanda 神田 "field for the gods" .
. Kanazawa choo 神田金沢町 Kanazawa machi district in Kanda .
. Kasumigaseki district 霞ヶ関 / 霞が関 "fog gate", "gate of mist" .
. Katsushika ku 葛飾区 Katsushika ward .
. Kawasaki district 川崎　- Tokaido .
. Kiba 木場 "place for wood" - lumberyards and carpenters .
. Kijichoo 雉子町 Kiji-Cho "pheasant district"　wood-craft workers .
. Kita ku 北区 Kita ward, "Northern Ward" .
. Kiyosumi choo, Kiyosumi machi　清住町 / 清澄町 Kiyosumi district .
. Kobunachoo 小舟町 Kobunacho, Kobuna Cho district ("small boat") .
. Kodenmachō 小伝馬町 Kodenmacho district .
. Koganei 小金井 and 小金井野菜 local vegetables . .
. Koishikawa 小石川 - and Koishikawa Garden . - - - - - Ootsuka 大塚 Otsuka "big mound"
. Komagatachoo 駒形町 Komagata district . Konyamachi, district for indigo cloth dyers . .
. Koojimachi, Kōjimachi 麹町 / 麴町 Kojimachi district .
. Kootoo, Kōtō 江東区 Koto ward, "East River" .
. Kuramae 倉前 The Bakufu Rice Granaries .
. Kyoobashi 京橋　Kyobashi Bridge .
. Matsuchiyama 真乳山 / 待乳山 .
. Matsugaechoo　松枝町 / 松ヶ枝町 Matsugae-Cho district .
. Meguro 目黒 and Meguro no Sanma 目黒の秋刀魚 . - - - . Meguro Fudoo 目黒不動 Meguro Fudo Temple .
. Minato ku　港区 Minato ward, "Harbour ward" .
. mon 門 the 36 gates of Edo castle .
. Musashi no Kuni 武蔵国 Musashi Province / 武州 Bushu .
. Nagasaki 長崎 in Toshima ward .
. Naito Kabocha Pumpkin .
. Nakano ku 中野区 Nakano ward - "Middle Wild Field" . Arai 新井 Arai district - "new well"
. Negishi 根岸 Negishi district - Taito ward .
. Nerima　練馬区　Nerima ward .
. Nezu district 根津 - Bunkyo ward .
. nihon, nippon 日本　Japan .
. Ningyoochoo, Ningyōchō 人形町 Ningyocho, Ningyo-Cho .
. Odenmacho 大伝馬町 The Communications Center .
. Okechoo, okemachi、桶町 Okecho, "Bucket district" .
. Oome 青梅 / おうめ Ome village (Aome, Oume) .
. Oota, Ōta 大田区 Ota ward .
. Ootemachi, Ōtemachi 大手町 Otemachi district . The place of the former 大手門 Ote-Mon "Big, main Gate" to Edo castle.
. Otowachoo　音羽町 Otowa district .
. Reiganjima 霊巌島 / 霊岸島 Island Reiganjima .
. Renjakuchoo, Kanda renjaku machi 神田連雀町 Renjaku-Cho district .
. Rokugō no watashi 六郷の渡し Rokugo river crossing .
. Ryoogoku, Ryōgoku　両国 Ryogoku district and bridge 両国橋　.
. Saeki 神田佐柄木町　Kanda Saeki-cho, Kanda Saekicho .
. Sakai Cho 堺町 Sakai in Edo .
. Sakuma 神田佐久間町 Kanda Sakuma-cho, Sakumacho .
. Sakuradamon Gate 桜田門 and Ii Naosuke 井伊直弼 (1860) .
. Saruechoo 猿江町 Sarue Cho and 猿藤太 Mashira no Tota.
. Sengakuji (Senkakuji) 泉岳寺 Sengaku-Ji and the 47 Ronin .
. Setagaya ku 世田谷区 Setagaya ward .
. Setomonocho　瀬戸物町　"Potter's district" .
. Shakujii 石神井 - Nerima ward .
. Shiba 芝　/ 柴村 Shiba mura / 芝町 Shiba machi .
. Shibuya ku 渋谷区 Shibuya ward .
. Shinagawa ku 品川区 Shinagaw ward .
. Shinjuku　新宿　- Naitoo Shinjuku 内藤新宿 Naito Shinjuku . - and Yodobashi 淀橋 "Yodo Bridge"
. Shirakabechoo　神田白壁町　Kanda Shirakabe-Cho district .
. Shizutani Gakkoo 閑谷学校 Shizutani School of the Ikeda clan, Okayama .
. Sotobori 外堀　/ そとぼり　/ 外濠 outer moat of Edo castle .
. Suginami 杉並区 Suginami ward .
. Sumida ku, Sumida-ku 墨田区 Sumida ward, "ink field" .
. Sumidagawa River 隅田川 and Katsushika 葛飾 .
. Taitoo, Taitō 台東区 Taito Ward .
. Tansumachi 箪笥町 / Ushigome Go-Tansucho 牛込御箪笥町 "Village of Tansu makers" .
. Takanawa district 高輪, Takanawadai 高輪台 .
. Tamagawa Joosui 多摩川上水 Tamagawa Josui Kanal .
. Tomizawachoo 富沢町 Tomizawa Cho district .
. Tooriaburachoo, Tōriabura-chō　通油町 Toriaburacho District .
. Toshima 豊島区 Toshima ward, "Rich Island" . and 巣鴨 Sugamo district "ducks nest"
. Tsukiji Fish Market 築地市場 .
. Tsukudajima 佃島 / 佃嶌 The Island Tsukuda　.
. Ukiyo-e ni miru Edo no meisho 浮世絵　Famous places in Edo on Ukiyo-E paintings .
. Unemegahara　采女ヶ原 Uneme plain - Unemebashi 采女橋 Uneme bridge .
. Uogashi 魚河岸 the Fish Market .
. Yagenbori 薬研堀 "Yagen Canal".
. Yaguchi no watashi 矢ノ口渡 river crossing at Yaguchi village .
. Yamanote 山の手 and Shitamachi 下町 .
. Yanaka 谷中 Temple town .
. Yaraichoo 矢来町　Yarai-Cho "Palisade quarter" - Ushigome Yaraicho 牛込矢来町 .
. Yatsukooji　八つ小路 Yatsukoji district . - "Eight small streets"
. Yayosugashi district 八代洲河岸 / Yaesu 八重洲 .
. Yokoyamachoo, Yokoyama-chō 日本橋 横山町 Nihonbashi Yokoyama-cho . Bakuro-Yokoyama is a now district in Tokyo Shitamachi.
. Yoshiwara　葦原 / 吉原　pleasure quarters, red-light district . - - - - - Okabasho 岡場所 "Place on a Hill"
. Yushima 湯島 - Yushima Tenjin Shrine .
. Yuurakuchoo, Yūrakuchō 有楽町 Yuraku-Cho district, Yurakucho .
. Shrines of Edo 江戸の神社 - INFO .
. Temples of Edo 江戸のお寺 - INFO . "There is congealed in the ōezu maps of Edo a peculiar compositional mode that fades from view when we look back from the perspective of a maps of Tokyo which introduced modern surveying techniques. At the center of the map is the white space of the shogun’s castle overlaid with the hollyhock crest of the Tokugawa around which is a mosaic of streets and daimyō residences reproduced with great precision. 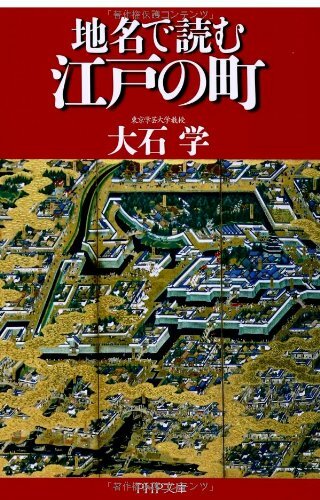 [...] This cartographic vision which scarcely changed for two hundred years suggests an image of urban space as it was understood by the people of early modern Japan. It is a series of concentric circles with the castle at the center."
. 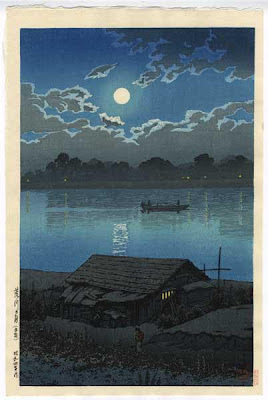 WKD : Place Names used in Haiku - Utamakura .
. 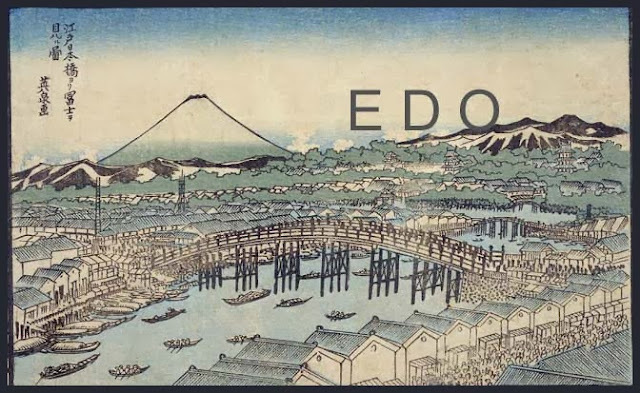 Famous Places and Power spots of Edo　江戸の名所 . The name refers to the temple Myosho-Ji, where it starts. 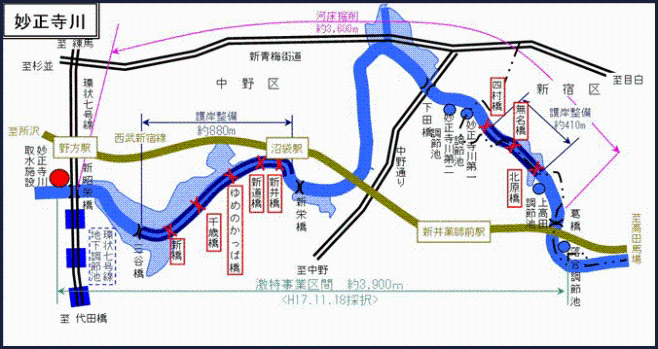 ... designated as a Class A river by the Japanese government with a length of 9.7 km and a basin area of 21.4 km². 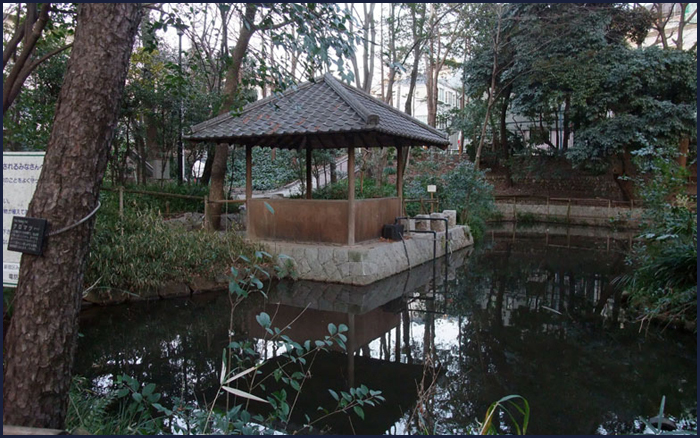 It starts in the 妙正寺池（Myōshōji Temple pond in Suginami Ward, and joins the Edo River later on. 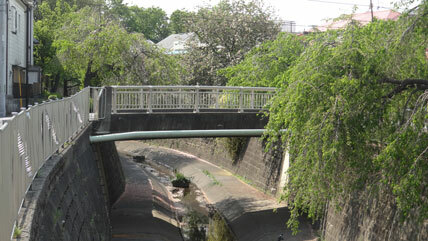 It flows into the Kanda River (Takadanobaba Channel) in Shinjuku Ward. Due to the progress of urbanization, the water retention capacity of the Myōshōji River has fallen and there is an increasing risk of water damage. To cope with this situation, the Tokyo Metropolitan Government has constructed revetments that can handle rainfall of up to 50 millimeters per hour. There are more than 50 bridges over this river. The river 妙正寺川 Myoshojigawa flows through this ward.
. Amanuma district 天沼 "heavenly swamp" - Suginami . 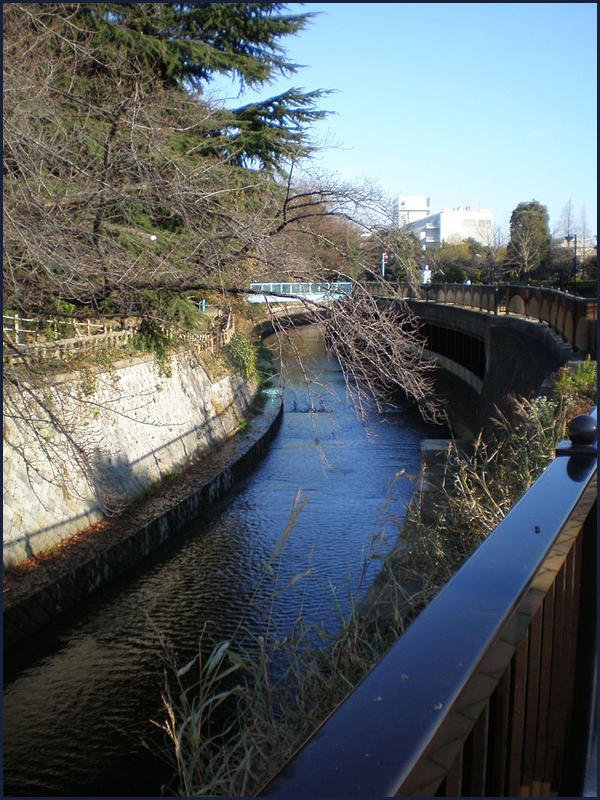 The rivers 妙正寺川 Myoshojigawa and 桃園川 Momozonogawa flow through this area.
. Igusagawa 井草川 River Igusagawa - Suginami . If flows into the river 妙正寺川 Myoshojigawa from the Arakawa water system.
. Ochiai 落合 Ochiai district - Shinjuku . The area where the rivers 神田川 Kandagawa and 妙正寺川 Myoshojigawa merged was called Ochiai.
. ensoku 遠足 excursion, day trips in Edo . The temple was founded in 1352.
. The Rivers of Edo . The name Iogi machi 井荻町 / 井荻村 Iogi mura was abolished in 1932. 上荻窪村 Kami-Ogikubo mura and 下荻窪村 Shimo-Ogikubo mura. The name I-OGI was constructed of the first letters from Igusa and Ogikubo.
. Igusamura, Igusa mura 井草村 Igusa village .
. Ogikubo 荻窪 Ogikubo district . 井荻駅 Iogi Station opened on 16 April 1927. If flows into the river 妙正寺川 Myoshojigawa from the Arakawa water system. 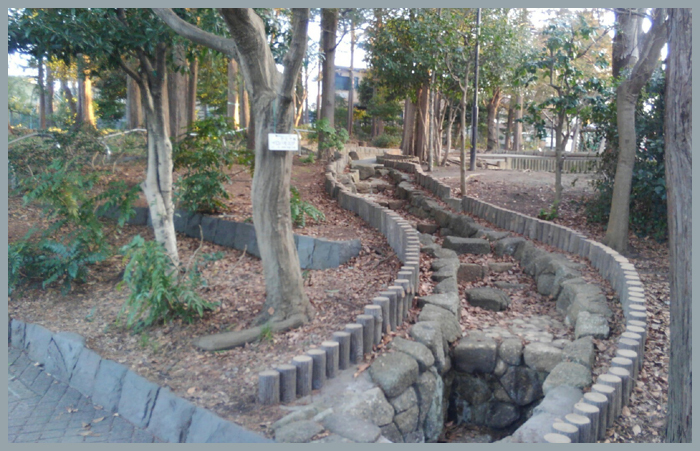 Part of the river is now a 遊歩道 promenade. In the park 道潅橋公園 Dokanbashi Koen there was a bridge over the river, better known as 道潅橋 Dokanbashi bridge. Along the river 今川 Imagawa is a park called 道潅公園 Dokan Koen.
. Oota Dookan, Ōta Dōkan 太田道灌 Ota Dokan (1432 - 1486) . In the Edo period it was an open space in the Musashino plain, called 久ケ山 Kukeyama. Around 1889, it was known as 久我山村 Kugayama mura village, with about 65 families living there. 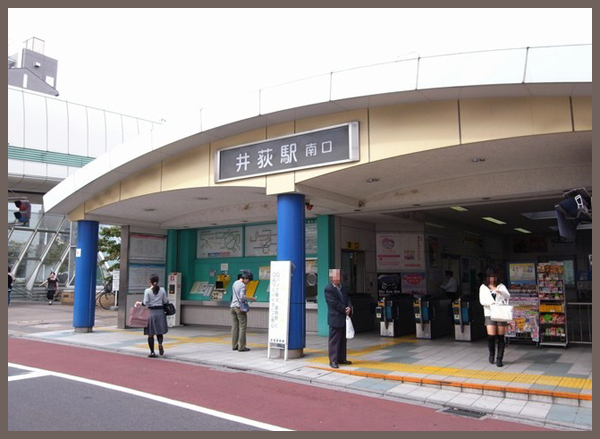 Located in the South-West of Suginami ward. A quiet residential area. 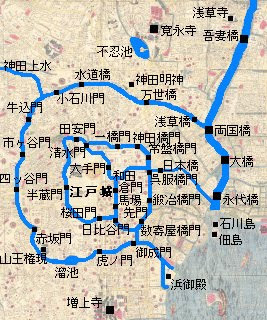 the 神田川 Kandagawa and the 玉川上水 Tamagawa Josui Waterway. - CLICK for more photos ! 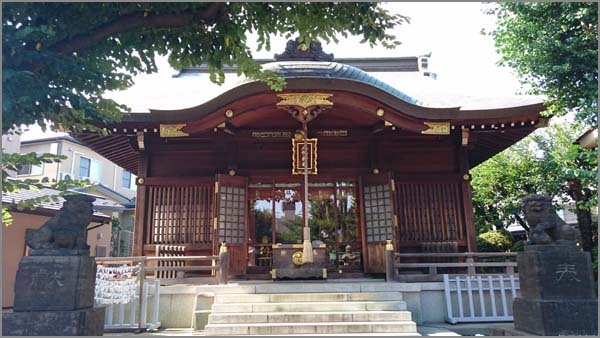 Since olden times the Shrine of the protector deity of Kugayama. The main festival is on the first of October. 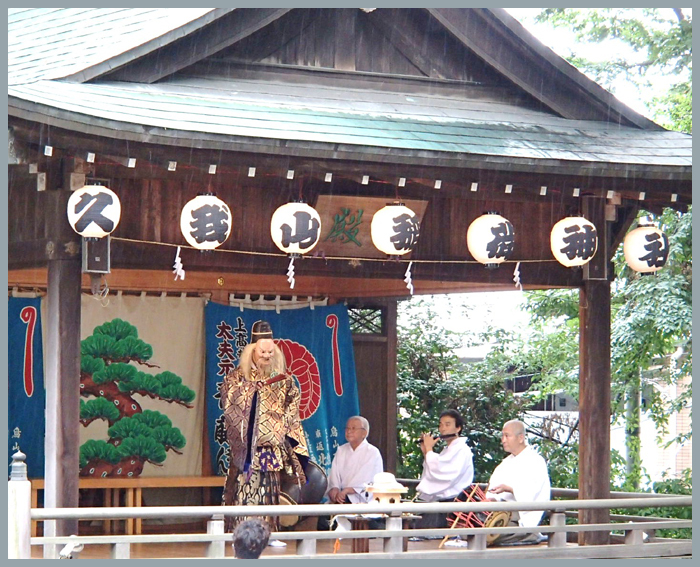 A Kagura dance called 湯の花神楽 Yunohana Kagura is performed. It is in memory of a time of epidemic disease, when water was boiled in the Shrine and splashed on the ground and on people to purify all. The name means 「田の端」にあった町 a town at the end of the fields. Another spelling is 田畑, meaning many rice and vegetable fields. In the Edo period, the area was called 豊島郡田端村 Toshima district, Tahata village. ... In the Edo Period, 田端村 Tabata Mura Tabata Village was located on a section of the elevated area that is geographically referred to as the 上野台地 Ueno Daichi the Ueno Plateau, but was to known at the time as 上野山 Uenoyama Ueno Mountain. The area was well known because one side was bordered by a cliff. Although, most people don’t notice it now, the west side of Tabata Station clearly shows the cliff – it’s just been woven into the fabric of the modern metropolis. It’s said that meaning of the name is 田ﾉ端 ta no hata on the edge of a rice paddy. Historical records and maps from the early Edo Period are vague at best, but the area would have been quite rural at the time. The presence of 田畑 tahata rice paddies and fields is more or less a given. Speaking of tahata, a second etymology says that via rendaku, tahata became tabata. Tabata sits on a ridge – a cliff, if you will – on the edge of the Ueno Plateau. The agricultural lands here were eventually surrendered to the Tokugawa Shōgunate in the name of 参勤交代 sankin-kōtai alternate attendance[ii], for the purpose of building daimyō residences and samurai residences. 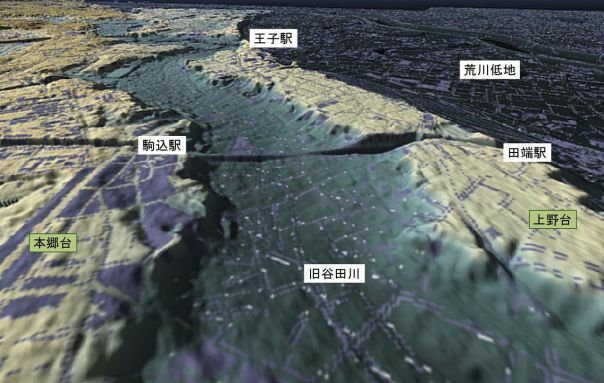 Without clear historical records, the “edge” could have referred to rice paddies on the plateau itself, or could refer to the cliff – a proverbial “edge” clearly delineating the yamanote and shitamachi, thus indicating the farming was being done in the valley. ... This alternate theory uses some archaeological findings to back it up. The area has been inhabited since the Jōmon Period but the real activity picked up around the Yayoi Period. During the early to mid Jōmon Period (7,000-4,000 years ago), this area was coastline, and the high areas were inhabited by villagers, communities highly reliant on the sea and not farming. 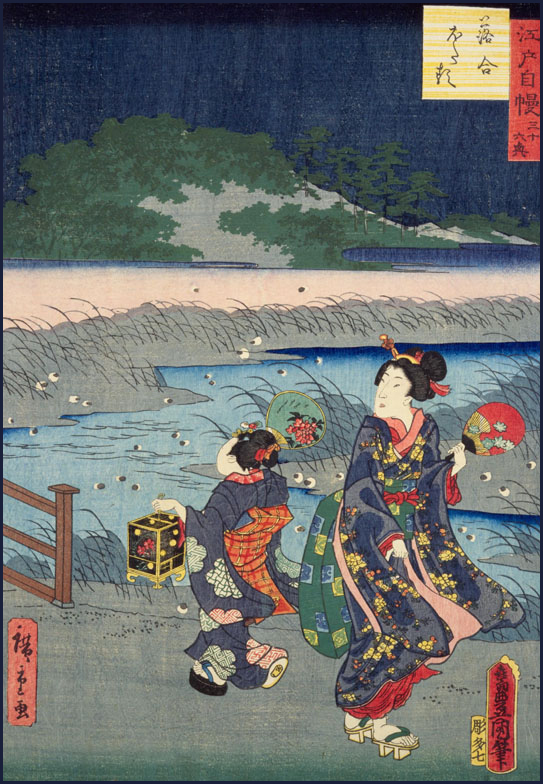 The sea began receding during the Yayoi Period and we find evidence of all kinds of coastal fishing activity, but no farming. Because the only people who farm next to the ocean are idiots. 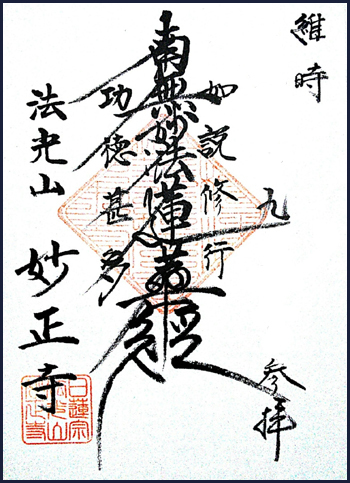 if this is an ancient name – not a medieval name – the kanji does not matter. Kanji have sounds (readings) but no kanji is divorced from meaning. It always has a meaning. Going by this theory, the archaeological evidence has led a small group of people to maintain that the name comes from a very ancient place name that originally meant “the top of the plateau.” One of the more interesting speculations was that the name is evidenced by 束旗 tabahata → tabata a bundle of flags, because the high ground is where you can build your fort (and of course put up your flags, which can be seen from everywhere).
. 宝珠山 / 寶珠山 Hojuzan　地蔵院 Jizo-In　与楽寺 Yoraku-Ji .
. 正岡子規 Masaoka Shiki .
. Toogakuji 東覚寺 Togaku-Ji . The shrine is located right next to Tokakuji Temple. It's told that this shrine started when Minamoto no Yoritomo, founder of the Kamakura government, stopped by on his way back to Kamakura after the conquest in North Japan, at the end of 12th century. 下十条町 Shimo-Jujo machi was located in the 東京都王子区 Oji district. The place where the deity 若一王子 Nyakuichi Oji / 若王子 Nyakuoji from Kumano are venerated. In this shrine Kumano Gongen 熊野権現 is venerated, not a prince. 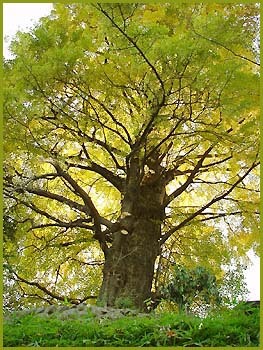 The Shrine is famous for its huge 王子神社のイチョウ gingko tree. The Oji Shrine was founded in the 14th century. It is situated on a hill and from there you have a great view. 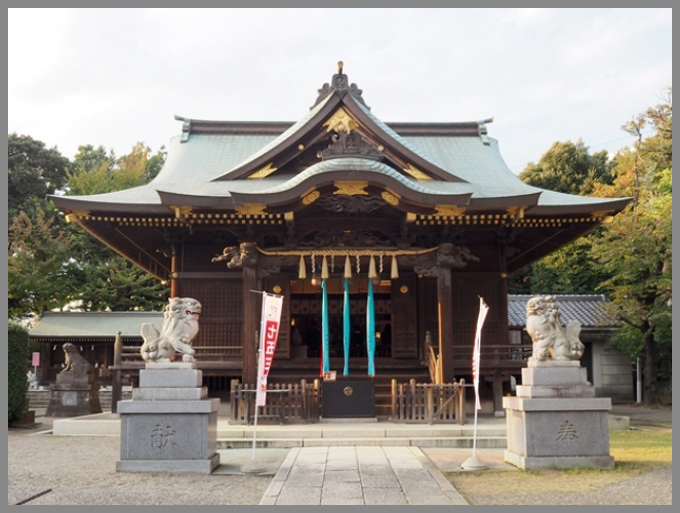 The shrine buildings of today were reconstructed after WW II.
. Ooji Inari Jinja 王子稲荷神社 Oji Inari Fox Shrine . This shrine was also called Kishi Inari 岸稲荷. Once a year on January 1, the foxes from the Kanto region would pay a visit to the great fox shrine . . .
A paper-making company from the area. 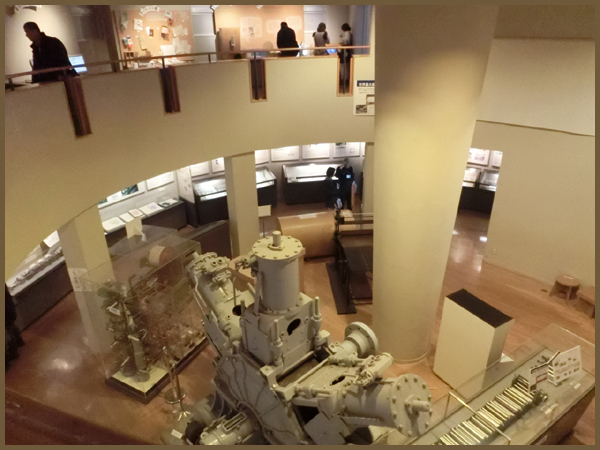 The area was known for its red clay, 赤埴 aka hani, later pronounced Akabane. 赤羽 literally means "red feathers". On the other side of the River Arakawa is 埼玉県川口市 Saitama, Yamaguchi city. ... Historically speaking, 赤羽村 Akabane Mura Akabane Village wasn’t a particularly important place, but in the Kamakura Period a highway called 岩槻街道 Iwatsuki Kaidō was built. 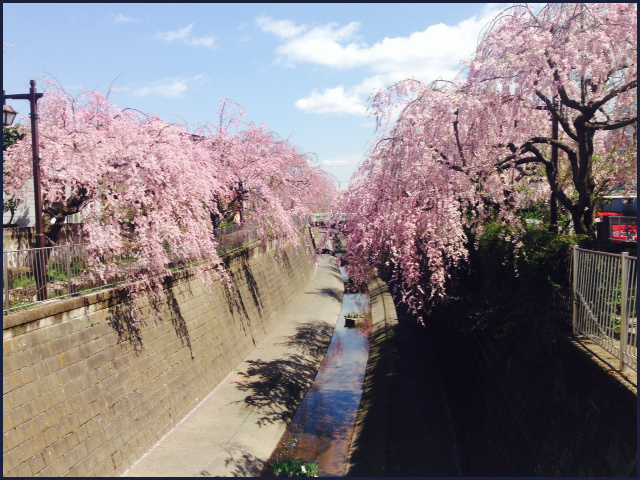 The road is better known by its Edo Era name, 日光御成街道 Nikkō O-nari Kaidō. はね hane is the old local dialect word for 埴 hani, clay. Apparently, 赤羽橋 Akabanebashi (Red Wing Bridge) in Shiba (Minato Ward) has the same derivation. Archaeological findings in the postwar years confirmed the existence of medieval kilns and earthenware factories. Convenient, cheap and cheerful. 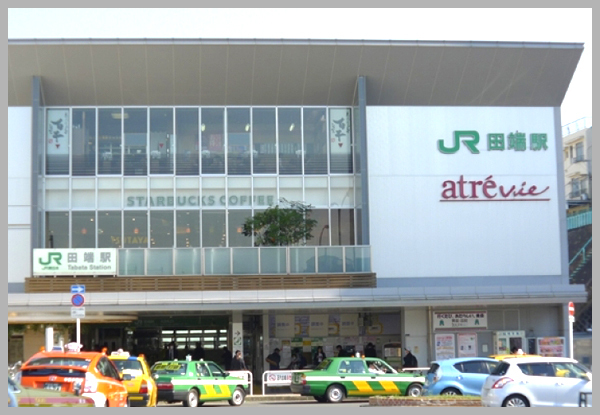 That describes Akabane, a residential area on Tokyo's northern border with Saitama that has true retro charm. 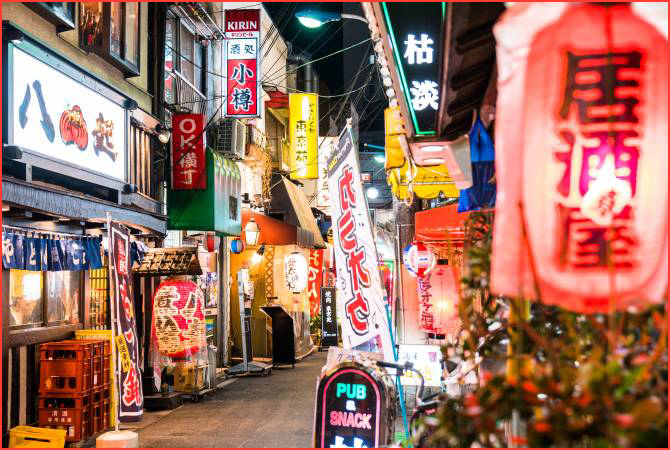 Popular with Tokyo's workers, the area comes alive at night when the narrow alleys around the station glow with red paper lanterns and revelers spill out of inexpensive bars and restaurants. Close by, the town of Oji is famous for cherry blossoms in spring and hydrangeas in summer at Asukayama Park, and its spectacular New Year's Eve fox parade. Kyu-Furukawa Gardens is a popular green space nearby, with a mix of classical Japanese and European gardens surrounding a grand European mansion. The shrine was founded in 784 by 坂上田村麻呂 Sakanoue Tamuramaro on his way from Kyoto to subdue the rebels in Northern Japan.
. Sakanoue no Tamuramaro 坂上田村麻呂 (758 - 811) . The main festival is in Mid-September in years with an even number, like 2018. 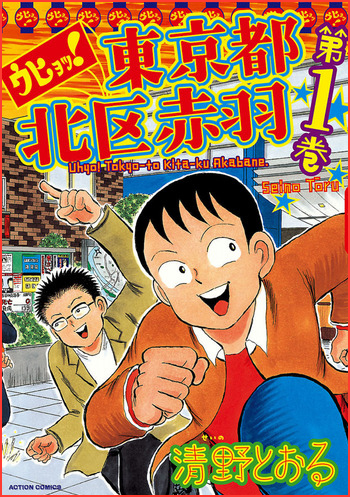 A non-fiction manga based on information gathered by the author Seino Toru, who lives in Akabane, in Tokyo. He depicts the bizarre episodes through his experiences with Akabane residents who have their own criteria for happiness (such as a charismatic middle-aged homeless woman) and strange shops in the area (such as a bar which never serves customers). As a sequel to Tokyo-to Kita-ku Akabane (Akabane, Kita Ward, Tokyo), it includes episodes which were not published. literally, "ten roads", "ten paths"
... The village first got mentioned in 1448 in a document called 熊野寮豊嶋年貢目録 Kumano-ryō Toshima Nengu Mokuroku. This was basically the annual tax reports of the 豊嶋氏 Toshima-shi Toshima Clan. The area was rural until quite recently and for most of its life was part of 豊嶋郡 Toshima-gun Toshima District. In the Edo Period, 豊嶋郡岩淵領十条村 Toshima-gun Iwabuchi-ryō Jūjō Mura Jūjō Village, Iwabuchi Fief, Toshima District was one of many villages on the 日光御成道 Nikkō O-nari Kaidō and the 鎌倉街道 Kamakura Kaidō. The former being the private road of the shōgun’s entourage to the funerary temples at Nikkō, the latter being the route to the ancient capital of the first shōgunate at Kamakura. The first stab at an etymology came at the end of the Edo Period. 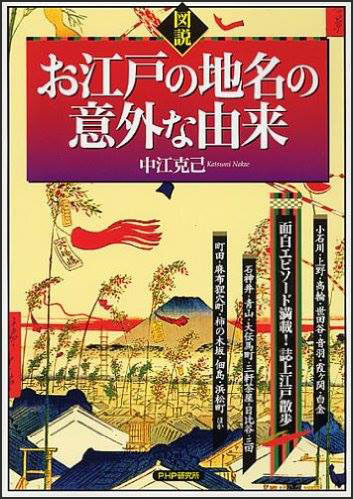 1804-1829 – 新編武蔵風土記稿 Shinpen Musashi Fudoki-kō New Description of the People and Lands of Musashi Province features the first extant recorded etymology. According to that book, 豊嶋清元 Toshima Kiyomoto oversaw the 勧請 kanjō ceremonial transfer of 熊野権現 Kumano Gongen from 熊野本宮大社 Kumano Hongū Taisha Kumano Grand Shrine to 王子 Ōji. In transit, the kami came to be associated with Kishū no Jūjōtōge 紀州の十条峠 a mountain pass in Kishū called Jūjō. ... In modern times, a more realistic etymology has emerged. This one points at the 条理制 Jōri-sei Jōri System as the root of this place name. Jōri was a system of land management (or for our purposes, a measurement convention) that was common in the Heian Period. Which brings us to the kanji. 条 jō meant “stripe, road” and 里 ri was a kind of measurement. So the jōri system described farmlands in terms of the size of certain swathes of land. If you’ve ever seen a rice paddy, it’s essentially a shallow swamp dug into an enclosure that keeps the water from escaping. 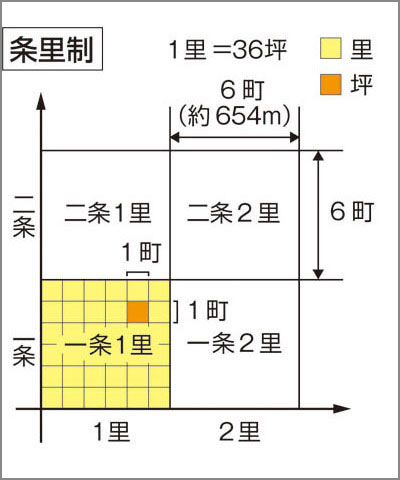 In the jōri system, 10 parallel 畦道 azemichi footpaths divided the paddies into discrete units. These footpaths used the counter for long roads, 条 jō. Therefore, 十条 jūjō means a “field that consisted of 10 parallel footpaths.” In short, this was a huge rice growing area divided into 10 sections. ... 条 jō generally ran east to west. - - - More in the WIKIPEDIA ! 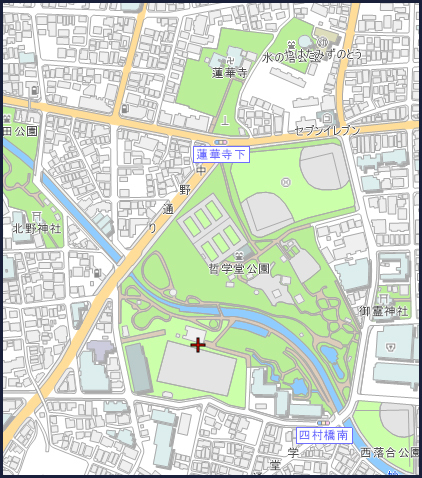 Jūjō (十条) is a working class district in Kita, Tokyo, Japan. It is about 10 minutes north of Ikebukuro by train. It is serviced by the Saikyo Line which stops at Jūjō Station. 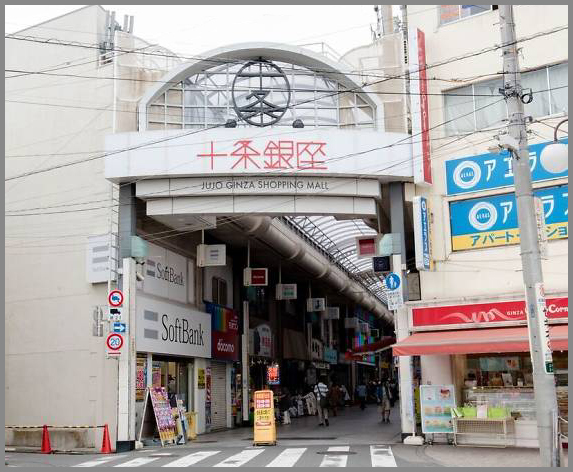 It is particularly well known for the long serpentine shopping arcade known as Jūjō Ginza, very close to the main entrance/exit of Jūjō Station. At first glance Jūjō seems a run-down place but a real sense of community thrives here, evidenced by the large number of traditional shops, small scale public baths (sentō) and enthusiastic festivals. Jujo Ginza 十条銀座　A fun shopping street! The Jujo Ginza shopping street is a long arcade shopping street that is fun to walk down. From delicious eateries that will entice gourmet-lovers to shops with cute clothing items and convenient daily goods and even relaxing massage parlors. You might find everything you need for your life here! This is an introduction of this highly charming Jujo Ginza shopping street. The first thing that will shock you is the number of eateries. Not only Japanese food but also Chinese food, Western food, side dishes and sweets. There is sure to be a delicious shop that will please anyone who visits! It's okay even if it rains!